Thank you, Jesus, for keeping our Family together! Wow, Heartdwellers - this is amazing! We adore You, Jesus, and we thank You for Your faithfulness. It's so amazing. You know, the Lord promised us that when we go to Heaven, that we're going to be connected together in Heaven. There's a Heartdweller Street! And we're all going to live on that street, or be close to each other. Heartdweller's Lane I think it's called. One of our prayer warriors' wife was in the hospital and had a near-death experience. And the Lord was showing her around Heaven - and He showed to her Heartdwellers' Lane! Where all of us will be living near each other. That is so sweet! But - more importantly for right now, people are beginning to trickle in, on the new channel. I want to thank you for your faithfulness. Thank you for looking until you found us! You all are such a part of my life. It was a shattering experience to see the community gone. Of course, all the hard work over almost 5 years of receiving messages from the Lord and seeing it disappear into thin air was very hard as well. But the Lord and your prayers, kept me from drowning in self-pity. Which is what I wanted to do, I'll tell you. If He hadn't just... If He hadn't just told me to put the tiramisu away and a few other things, I really would have gained a LOT of weight this last weekend! And the Lord gave me a wonderful promise this morning. He said, 'In a pillar of cloud I will speak to you. And you hear My commandments, for I am gracious to you.' And that was the first Scripture, the first rhema I ever got, from the first Bible - RIGHT after my incredible conversion. I opened the Scriptures and started reading. And that is what I opened to, in one of these great big, giant family Bibles. 'In a pillar of cloud I will speak to you. And you hear My commandments, for I am gracious to you.' Because the night that I was saved, a pillar of fire came down out of Heaven. And the Lord spoke to me for the first time there. And you can read about that in our conversion stories. Testimonies. So, it was nice to see that confirmation of my calling again from the Lord. After all this trauma. So, let's ask a question. How did this happen? Well, that's an interesting one, because it's been over a month and a half since I had passed the word along: C'mon, we need to get a new channel up, guys. A back-up channel. We'd been toying with it. And other things would come up and kinda get in the way. So, we weren't prepared when it hit. I guess experience is the best teacher. I don't think that's gonna happen again. In fact, we're planning on being on at least 3 different venues, so you won't have this problem. But there'll be only one place where we'll respond to comments, 'cause we'd be too much for us to go through all these different places to check what the comments were. On that note, if any of you would like to have a Still Small Voice channel on one of those venues and be responsible for posting the videos - get in touch with me and let me know. 'Cause I'd really like that. I don't want to put all the pressure on my staff to do that, because they are already loaded down. The other ones that were flagged were "The Lord Teaches on His Church & The Immaculate Conception of Mary". They said that violated community guidelines... And I looked and looked and could see no reason whatsoever why that violated anything, except perhaps the enemy's fear of Our Lady! "When Giving Up Is Not An Option: Part 2" - that was flagged. "Curses & Assignments on All Christians Spiritual Warfare 12" - that was flagged. "Come, Enjoy the Lilies" - that was flagged. "Stand Firm--Evil Days Are Ahead, But Short Lived" - that was flagged, too. "You Have Won A Victory-Now Move Forward With Your Gifts!" - and that was flagged. "More Suffering... Have FAITH" and on and on and on...so you get the picture. These were flagged. For what?? I have no idea. I did protest it, but I don't expect them to relent. Some of these videos have been up for 4 years, guys??? And I never heard a peep out of them? You know, I've got a history on the Channel. I've got two strikes - is it two strikes...or one? I'm not sure. One or two strikes in 5 years. And now all of a sudden, they just come flooding in the door. That's highly suspicious. So, they also took the music channel down, of course, all of our original music. So they couldn't complain about that? Your guess is as good as mine. I can't figure out what they did, or why they did it. Except when I first started my Youtube channel, the very first message I got was a picture in my inbox. A photograph of Obama. He was standing, facing a mirror that was on a door. His back was to me, but he was facing the mirror and he was looking right at me. So, I took that to mean, 'I'm watching you!' And I wanted to say, 'What in the world are you watching me for? We don't bear arms. We live a clean life. We don't do drugs, we don't...you know?? What in the world are you watching ME for? And...I guess that Christians are on the doo-doo list. I don't know what else to call it... Anyway. It's all a bunch of doo-doo, that's for sure. So. It was eerie - to say the least. But the Lord told me when I got on the Internet, and did Heartdwellers, that I was going to be behind enemy lines. In fact, I had a dream about it. A very, very funny dream. This little girl - we were flying in one of those, those big planes that drop parachute - people in parachutes out, you know? One of those big army things. I had on a pretty, pink party dress - and pink socks and pink shoes. Blond curls were all done up - and I had an umbrella for a parachute. And the Lord told me to 'jump!' So, I jumped! And I just floated down very gently. And He said when I landed, 'You are now behind enemy lines.' So, there you have that. That's pretty interesting. I guess they took down Alex Jones, Lana Vawser, too - and a bunch of other Christian channels. One of our prayer warriors said they have taken down every one of the channels that she has listened to for years. After I got over the shock, I had to wonder..."Me? Little ole me?" To be honest, for a moment I felt flattered that I was such a threat that they had to take me down. Maybe it was the kind words I spoke to the Satanists - maybe that got me into trouble. I don't know. In any case, we're back with a new strategy and you will be seeing me on several platforms, including on our website. And videos that are independently posted through our own system. That's going to take a little bit of time, but we are going to get an uncensored platform that you could incorporate into your website, and keep all your videos. And it's controlled by no-one. It's not a censored site. It's something that you buy and you use on your own website. So, we're gonna work on transferring every single video that we have to that platform. So that, when you go to our website, Heartdwellers.org, you will always see the videos up. They'll always be there. If Vimeo takes us down, then we'd still have the videos there. I don't expect to be taken down by Vimeo. We're not going to go against any of their laws or rules that I know of - I looked them over. But you just never know who's connected to whom and where the persecution is going to come from next. We don't know. So, please be patient. We're going to put playlists together, under the option of 'Albums' or groups on the Vimeo site. They also have Channels - and we haven't figured out what all these things mean. We're just testing the waters. At least now you have every video that I've ever posted. So, you've got them all. It's just that they're not real organized. They're better organized, I think, on the website. But you know what? Even on the website, I've told our webmaster I wanted to start grouping things together by needs that people would have. You know, Spiritual Warfare. Or Emotional needs. The need for Peace. The need for Comfort. The need for Faith. I want to start doing this. So, we'll be doing that on this channel, for sure. Vimeo has a lot more cool options than YouTube. Although, there is a fee. A yearly fee to pay for videos to be on their site. I'm happy to pay it, if it's secure and good. I can't tell you how much you mean to me, Heartdwellers. I don't know how to convey that to you. Well, you know, I complain sometimes about being too busy, and after I've answered all the comments on the videos, I'm pretty tired. But, never again will I say-even a hint-of being tired of comments! I miss you so much! On Saturday morning, when I went to see who had posted what and who needed prayer - and none of you were there - it was very traumatic! Very, very hurtful. And when we get comments, I'm overjoyed to talk with each of you personally, and see what's going on in your life. And to put you on the prayer chain. And I missed that so badly over the weekend. I hope you'll start posting comments now on Vimeo, so that I can at least hear from you. We have a wonderful community of believers. The kindest, gentlest, most self-sacrificing and faithful - I could go on and on about each of you - you are so wonderful. It is indeed a rare thing on YouTube to see so much brotherly love. Very much like the Early church at Philadelphia. The on church that was promised to be delivered in the Rapture! Anyway, I am so honored to have you all in our community. Now the challenge is to get our audience back and make sure they can find us. So, please whatever you can do to help us, please do spread the word. 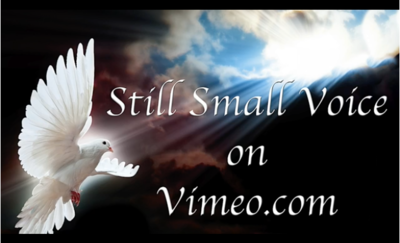 The way it's written on Vimeo is Still Small Voice on Vimeo.com. Also, I'd love to see comments from you and get back into the habit of talking with one another. Vimeo's system, is pretty much the same as YouTubes, but with a lot more nice options. But what I miss the most is community and sharing under the videos, and prayer requests. I've been very grieved to miss all of the wonderful conversations that we've had under videos. 'Cause those all went down the tubes when they took the Channel down. So please, go to town with those! And we'll try to keep up visiting with you...joyfully!!!! Wow, you don't know what you have until you lose it. That's a very true statement. And I'm so happy to see you flooding back in on Vimeo dear ones.